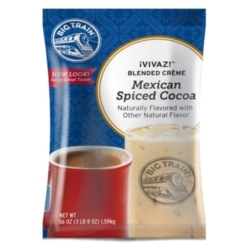 Rich dark cocoa, sweet brown sugar and spicy cinnamon are blended perfectly in each cup of Big Train Mexican Hot Spiced Cocoa. Pure natural ingredients. No trans fat. Comes as a case of four 3.5lb bags. $0.35 / oz. $0.34 / oz. $0.32 / oz. $0.31 / oz.